I didn’t stay long with Mum, Dad and Dan at CP2 – not wanting to get cold and conscious of the time ticking away. I was aware of others behind me at the checkpoint long after I left, and had heard one guy say he was retiring due to injury. It was a little while before the sweeper caught back up with me again and he commented that I must have sped off. Several sections of the route between CP2 and CP3 were on road and I wanted to make time up where I could. I ran for a little way with a guy, Phil, and we were joined for a bit with another guy whose name I never caught. He had come out in road shoes and told us that he hadn’t been aware of what the Dusk ’til Dawn event entailed. He was really the only negative person I encountered the whole race and I did get a little frustrated stuck behind him along the narrow trail stomping along for a while until the path widened and I could pass. There was a really steep hill section around mile 13 where we were literally pulling ourselves along by the fence posts to our right. I was determined not to stop, but to keep going at all times. This, like many parts of the course was completely unrunnable! I imagine for anyone that didn’t regularly work out parts of this would probably have been unwalkable at all! We hit the second road marshal at 14.5 miles, who rushed out to tell Phil and I that we were only 2 minutes ahead of the cut-off time. I knew there were still others behind us at this point, having overtaken a few struggling up the steep climb. It put me into a bit of a panic though. There was no way I wanted to be withdrawn this early into the race! We picked up speed, and luckily, it was at a point where there was a lot of road sections. Although we also chanced some more technical tracks – jogging over rocks and mud. Phil slipped down in a large puddle, knocking his ankle which he said was already weak from previous injuries. We continued on though – picking up pace where we could and just as we picked up a faster pace over a generally flat bridepath Phil’s ankle buckled and he went down again. This time he couldn’t continue and was in a lot of pain. We had to stop on the side of the road to make a plan. I worked out roughly where we were on the map, knowing that we were about 30 minutes past the last road marshal and we called for help. Apparentally we weren’t far from the Duke of York pub, where he could sit and wait for help, so I walked about 3/4m-1m alongside Phil as he hobbled along the road. I wanted to push on, but felt guilty for thinking about it, knowing I couldn’t leave him. Once I had dropped him off I managed to run for a good mile or so before coming to several fields. I paused here to get my bearings and also pop on Dan’s gloves I’d borrowed for the event. Gloves are the one thing I’ve never needed to run in before but the long pause in running from helping Phil had meant I had started to get cold. I wore them the rest of the race. I determined that I should go straight ahead, but the couple close behind beared through the field to the right. Doubting myself I followed them, although when they paused and I caught up I mentioned that I thought we should be further over. They pointed to about five headtorches in the distance bobbing away so I followed along behind. However, when we caught up with those five headtorches, all five runners were bent over maps looking for a way out of the field! Lesson: Don’t assume others know where they are going either! In the end we all took it in turns to leap over a high wall onto a road and run down into the village where Checkpoint 3, Earl Sterndale School was. The first indoor checkpoint. I had pushed past all seven people and was first to reach the school, although was aided getting there when I ran straight past and dan lept out of the car to call me in! Here I had my water bottle refilled for me whilst I pulled the checkpoint card from my chest and hurriedly asked the marshal how much inside the time I was. Despite slowing to help Phil and following others over the wrong route I had made up time and was now 20 minutes ahead of the cut-off time. I was surprised at just how many people there were in the school still. The large crowd of seven came in behind me, but there were already several runners crowded around the food station, at which I grabbed a mini donut on my way out, and several were still getting changed into the clothes from their drop bags. I didn’t intend on sticking around and headed back outside for a quick chat with my family before making off along the road again. We weren’t on the road long and it soon turned off up another incredibly steep hill through a field. 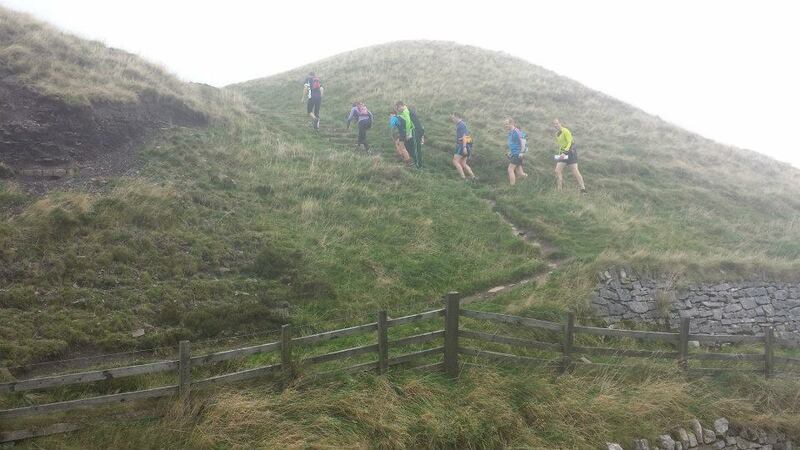 Picture from DtD FB page, of a recce run earlier in the year. This point of the course was really all about keeping my eyes open for the tiny sticks of reflective tape dotted every so often to keep us on the right path. Some of the places they placed tape were really inventive, and they had even wrapped tape around some of the thicker grasses growing on the ground! I ran much of the next section alone, although could see two headtorches not far infront of me. It was really eerie glancing around with my headtorch to try and spot the tape, thinking I saw some, but when I moved closer realising it was just a pair of sheep eyes! We came out in a small village just past midnight where I caught up with the two gentlemen infront and a woman popped out of her house to see where we were walking to. When we told her we had come from Castleton and were raising money for MacMillan she pointed us in the right direction and we were off again. There were so many stiles on route, and by now my leg was cramping each time I cocked it over a stile. Still fit, uninjured and incredibly enthusiastic though, I bounded on. Now knowing that I was ahead of several runners who had possibly set off too fast and faded as they got further into the course. As I had run at the back with Charlie earlier on he had commented that I would pass all those that were bunched infront of me and do better than them. I felt proud that this was now the case. I started running with Vicky, somebody that had lost her running partner to injury, not confident with navigating on her own and was worried that she now wouldn’t make the cut-off times ahead. We teamed up with the guys ahead of us and it wasn’t long before we saw the Cat & Fiddle sign of CP5 in the distance. We rushed in to hear that we were on the borderline of the cutt-off so I grabbed two bourbon biscuits from the feeding table (these worked a treat – must remember for next time! ), got my bottle filled, checkpoint card punched, we had our photo taken and were off again. Well done for overtaking people! I remember reading some good advice that when you’re running a marathon or ultra you should be letting people overtake you at the start, running with people in the middle, then overtaking at the end if you’ve got your pacing strategy right. It sounds so mental about the cut off times and running in the dark. All very tense! Kev, the ultrarunner who I run with frequently at my running club made it very clear to me that at the back was the best place to start. Much better mentally to cope with passing people than to be passed 40 miles in! It’s such bad luck to have followed those other runners off course, but I’m sure anyone else would’ve done the same thing. You can sit back in your seat now. The final instalment has arrived! Hehe! It was a tough decision to follow them at the time, but I shall know better for next time! Stick to my instincts!